Can Paixano Barcelona (Xampanyeria) is not for the weak-kneed or faint of heart. It’s the real deal. It’s a loud, crowded, rowdy, messy, salty, drunken experience not to be missed. Located on a narrow side street in the Barceloneta neighborhood of Barcelona, Can Paixano is safely hidden from the unwashed masses of tourists plaguing nearby La Rambla. Can Paixano has been around since 1969 and after spending a few minutes in the crowded bar, you get the reassuring feeling that not much has changed. 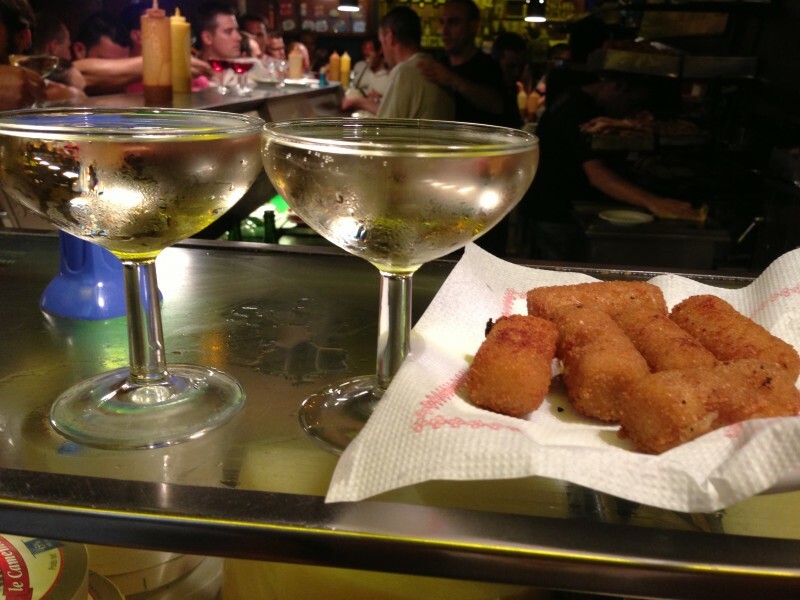 The classic 2 inch thick bar – just wide enough to fit a glass of the house Cava – is almost always crowded with locals and a few in the know tourists. The menu consists almost entirely of super salty drunk foods including strong cheeses, countless sausages and cured meats and of course cured fish. Our first visit to Can Paixano was during the afternoon. Being first-timers we made the mistake of ordering a couple glasses of cava. This a mistake not because the cava was bad (it was delicious) and not because it was expensive (around 1 euro per glass). It was because we soon realized we could get a whole bottle of cava for 6 Euro (afernoon hours only). After discovering this, we eagerly ordered a bottle of Rosat Cava. We tasted a variety of sandwiches with grilled veggies, salty cured pork and cheese as well as some deep fried croquetas. 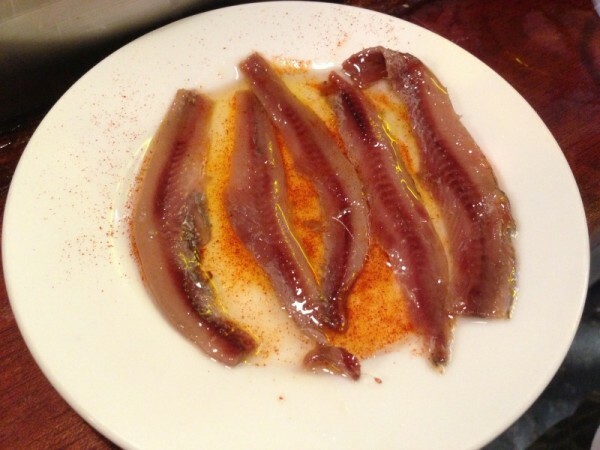 We also ordered three tapas of cured fish (anchovy, sardine and cod). As rookies when it comes to Spain’s lover affair with sodium, we found the Anchovy and Sardine too salty to finish. The cod had a nice citrus taste and we finished it right away. 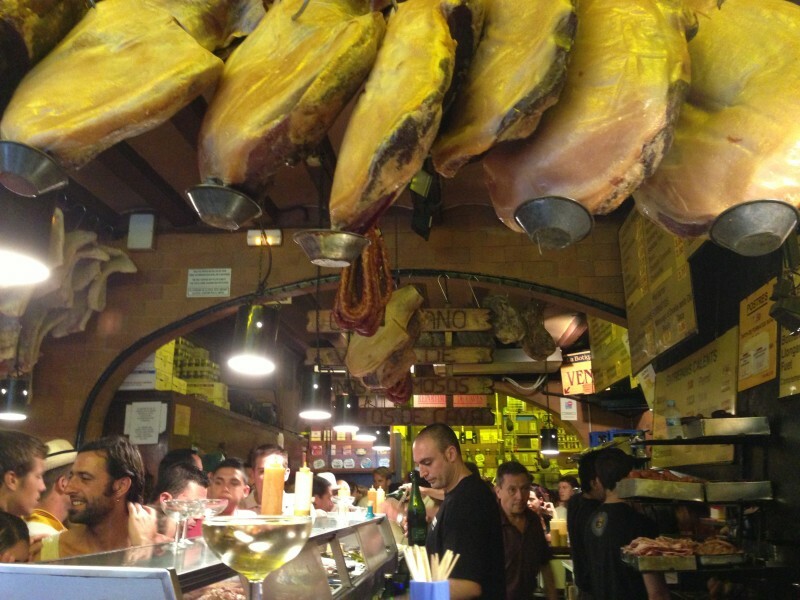 A visit to Can Paixano is a definite must if you’re in Barcelona. Every city has a beloved local place like this: unapologetic, rough around the edges and likely to never change. One of our favorite spots during our 6 night stay in the city. Tags: Bar, Barcelona, Cava, Spain, Tapas, Wine, Wine Bar.